People First: Referendum hots up -Pensions, Bus Passes and Remain's last throw of the dice. Referendum hots up -Pensions, Bus Passes and Remain's last throw of the dice. After weeks of quite genteel bickering on details, the last days of the campaign are different. The Remain side have suddenly realised that this may not be a walk over for them, and have sent for Gordon Brown to tell Labour Voters to vote Remain. Legend has it that it was Gordon who won the Scottish referendum for Stronger Together by his intervention, promising home rule if you voted NO. Almost total independence with less risk, control over everything bar foriegn policy and defense, otherwise known as Devo Max. Scotland voted No but didn't get home rule as promised by Gordo. If this continues to follow the Scottish Referendum model, the next move is a "Vow" by the leaders of the 3 main Westminster Parties. Due to the sharp decline in the number of Liberal Democrats we may expect a trio consisting of David Cameron, Jeremy Corbin and Nicola Sturgeon promising that the EU will be reformed, immigration halted and the economy magically turned round by a Remain vote. Just like in the Scotland Referendum Case, the 3 leaders won't actually get together physically, too embarrassing, but will instead be photo shopped suitably for the front of the tabloids after their staff have cobbled together a vague, upbeat statement to save the day. We will be promised some European Union future so British that we will hardly realise we are part of the EU.,Promises of major EU reform and a nod to reducing immigration, followed by a guarantee of a massive turn around of the UK economy and jobs for all. Maybe Nicola will duck out of the fantasy offer and someone will dig up Tim Farron to make up the trio. A welsh edition would have Carwyn, Leanne, and ?someone else from any other Welsh party supporting Remain, or just anyone Welsh and famous. I doubt a "Vow" will make much difference. Most people have made up their minds and many have voted by post already. It has to be a real stunner to win it now, and if Remain do win it may well be thanks to the votes in Scotland and Northern Ireland, a bizarre irony. However, as someone who was in Scotland during the referendum campaign I feel it was the pensions argument which made the biggest difference there. If Scotland left the UK they were told, Scots might have to leave the UK pension system and there were warnings that the state pensions may not be paid at all after a Yes vote. Of course it probably was an empty threat, but if the state pension is a large part of your income you can't take that chance. However, .Project Fear has a lot less traction now in the UK than in Scotland 2014, as trust in politicians declines, the economic outlook is poor and the threats get so ridiculous that its hard to credit that those who "advise" us actually believe what they are saying . 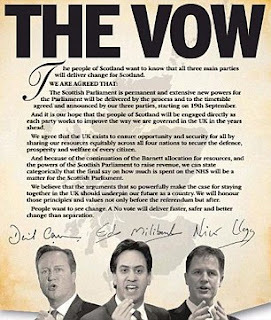 Now what could a Welsh "Vow"contain for Wales?. Will they promise decent roads, new rail links, plans to save our Steel Industry, and jobs for our young people? Probably not. David Cameron, may rely on his recent threat of a possible Brexit induced economic dip which will apparently force him to cut the state retirement pension and abolish free bus passes for the elderly. However, as our bus passes are devolved to Welsh Government, and are one of the most popular policies of our devolved parliament, will Carwyn Jones back him up? In Politics trust is hard won but easily lost. We have an interesting week ahead. Did you support Scottish independence? Yes. I lived in Scotland for some years before coming back to Wales in 1994 and campaigned for Yes in 2014 in the Dundee area, where I used to live and work. In response to your question on my views on Welsh Independence,anonymous, yes, I'm in favour. In contrast to Scotland we unfortunately don't have a major Nationalist Party solidly in favour of independence. Plaid Cymru's stance of waiting for independence until the economy improves is, in current times when we probably will have poor economic growth for many years if not decades, just a cop out. The EU gives us the worst of both worlds, a European proto state failing in many areas but regarding the UK as our only government, and the small national parliaments/assemblies completely subservient to the UK. Now this give our Welsh Parliament the advantage of being able to ignore EU directives on sewage treatment or air quality but does not further the development of Wales economically or socially other than as an EU after thought. Similarly the UK can duck its responsibilities by pretending that the EU structural funds will make everything OK for Wales when they have had little impact on improving our economy. We are in a better political position to improve our lot, I believe, outside the EU, whose imperial ambitions, I found in Scotland, were certainly not sympathetic to the small nations of Britain. I think we are all better off out of the EU.